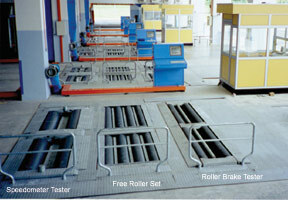 VLT offers two types of free roller sets, developed for intensive and heavy use in automobile Test Stations. There are two models; the first one is a 8000 kg three rollers pair and the second one is a 16000 kg four rollers pair. Both models have a hydraulic lifting system between the rollers and a roller Braking System for safe driving over the rollers when not in use, and for easy driving out of the rollers after use of the free rollers. Free rollers are needed for testing speed on Speedometers for vehicles with double drive axles and can be used for older types of vehicles with double drive rear axles in combination with a transmission handbrake on the propeller shaft. On modern vehicles transmission handbrakes are no longer installed. The VLT free roller sets have an aluminium coating on the rollers as corrosion protection. Again, VLT decided to use the more expensive hydraulic lifting and braking system instead of the more common pneumatic system because the hydraulic system is more powerful and more reliable. Normally the VLT Speedometer and the VLT free roller set share the same hydraulic pump and are controlled by the VLT Speedometer controller.